An LN300 composite video camera was placed at the prime focus of an f/5.5, 80mm, ED refractor mounted on an iOptron Cube Pro, AZ, GOTO mount. 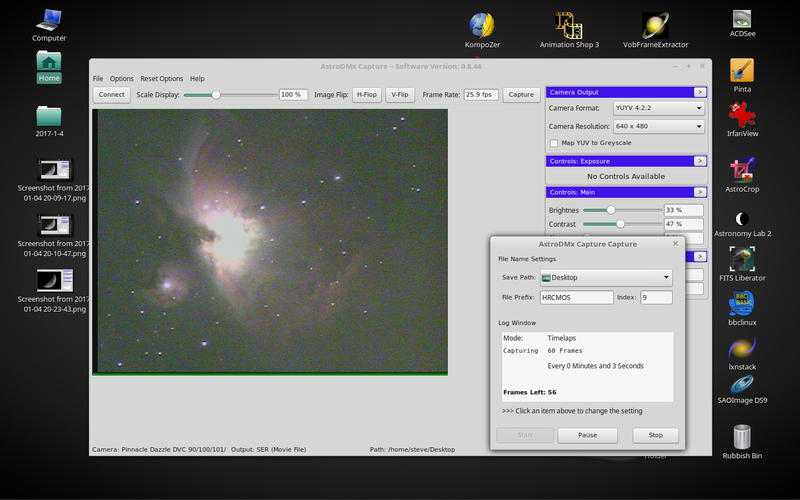 A USB capture card was used to capture the colour, composite video stream using Nicola's AstroDMx Capture for Linux, on a Linux Mint laptop. 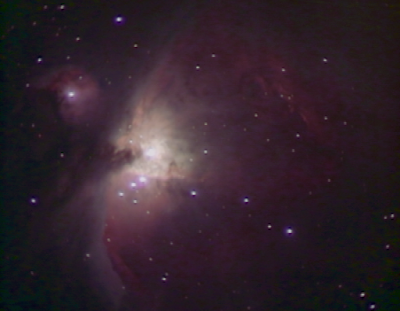 The camera was used in long exposure mode and 3 x 60 frame SER files were captured of the Orion Nebula, at each of the following exposures: 0.64s, 1.28s and 2.56s. The software was used in time-lapse mode to capture unique frames at each exposure. The images were extracted from the SER files as TIFFs using SER player. The 180 resulting images were de-rotated and stacked in lxnstack. The resulting image was processed in the Gimp 2.9.